This is my new favorite lunch, and I've had it two days in a row, served with a nice green salad. Slice your potato in half, then use your knife to make hash marks throughout the white part of the potato. This makes open sections for the topping to seep into, plus makes eating without a knife much easier. Top with sauerkraut distributed between the two sections of the potato. Add dressing and sprinkle on bacon bits. EAT! 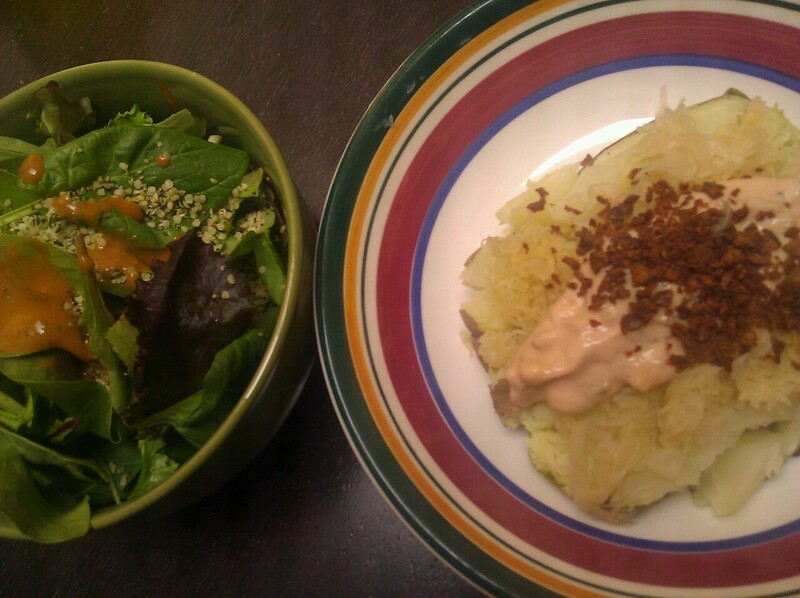 Made with a 6 oz potato, and using EXACTLY the dressing below, about 250 calories. 10 dill hamburger sliced pickles (the "corrugated" ones) chopped fine. You can use relish, but I find it WAY too sweet. Stir together. This makes enough for TWO potatoes,. Store covered in the refrigerator.